As Nipun and I drove off around midnight, after the meditation circle, we wondered what time Pancho would get home on his bike. Ever since he decided to stop contributing to the oil wars, and not use any gasoline, he has been pretty much biking wherever he needs to go. This caused a conflict with attending Awakin circles in Santa Clara, which he rarely missed in the past 7-8 years. He decided that he would bike down from Oakland to Santa Clara and still attend once a month. It's a good thirty-five miles (one-way), even on the backroads. Initially, we all thought it was a crazy idea, especially because we end so late at night, not to mention that it's 70 miles of biking in one day. But Pancho in his crazy, stubborn ways, kept at it and has been showing up on the clock every month. Many like Sam, have accompanied him over the year or so. As he was leaving this week in the freezing cold, around midnight we all took turns trying to convince him to get a ride from us or leave in the morning. He was speaking to a group of children in the morning so he couldn't stay. And he didn't want to remove the peace flag to load the bike in the car. The flag stays on. After the back and forth tussle, we both left the house at the same time. 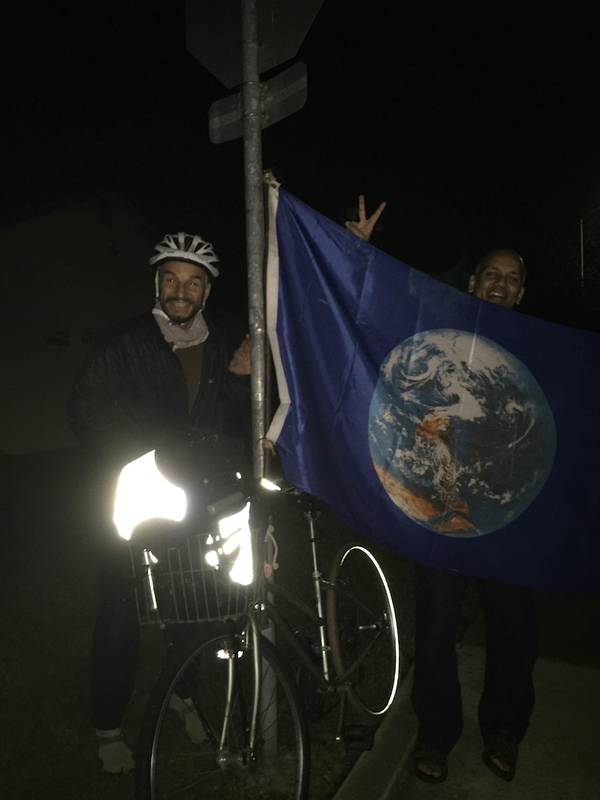 Nipun and I in our car, and Panchito on his bike with the world peace flag on a pole. I jumped in the car and quickly turned on the heater, realizing how cold it would be for Pancho. Nipun asked, "How many friends do you know that would do this on principle, and show up every month for you?" As I searched for Pancho on the road, "Not many," I answered. "And with that heavy flag," Nipun added. It's not like he himself doesn't hold Awakin circles each week ... he doesn't need it for himself. It's purely on principle. We calculated that he would reach home around 4:30 AM and barely get a little shut-eye before he would be up and out again, sharing his love with the world. Thank you so much for sharing this! it not only inspires but also shakes us up to the millions of possibilities that could emerge when your life is backed with 'principle's'.